The first stage of the day took in a loose and loamy traversing track which got steeper and offered some line options, drops and technical turns. 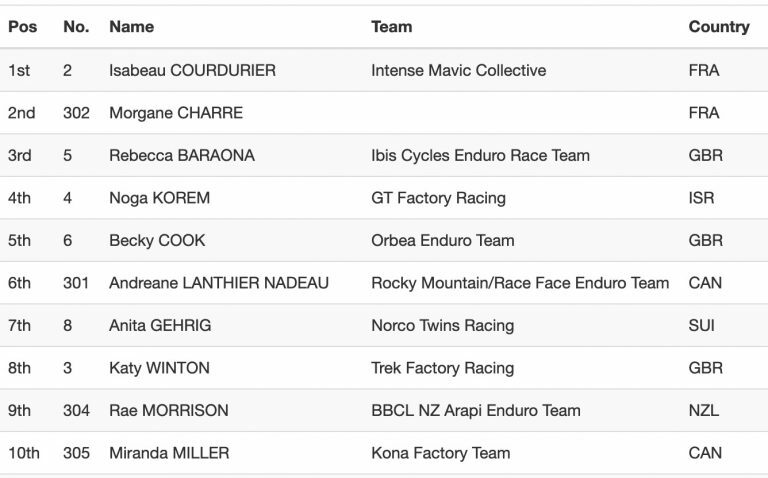 Courdurier took out the first stage in the women’s field. 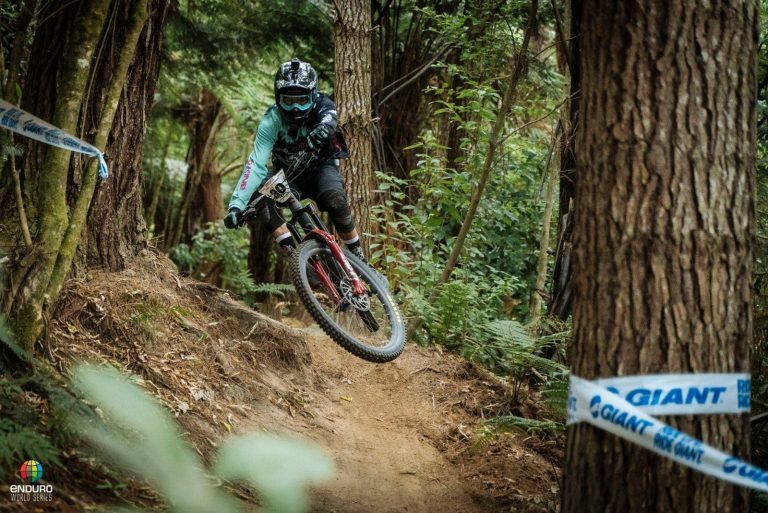 Hot on her pedals, with only seconds to spare, was another Frenchwoman, Morgane Charre chased by British dynamo’s Rebecca Baraona, racing for Ibis Cycles Enduro Race Team and Katy Winton, with Trek Factory Racing. The depth of talent in the women’s field was striking and it was evident today with only seconds separating the top-seeded women, across majority of the racing. Courdurier won stage two but a change of pace saw Charre snare the win for the third stage of the day, a native single track section of the forest which was described by the riders as “extremely physical”. Charre led the field of women into stage 4, the Queen’s stage, from Te Mounga and into Moonshine, but Courdurier was proving that she was in fine form leading in. Courdurier clenched the stage win by 3-seconds, ahead of Britain’s Becky Cook (racing for Orbea Enduro Team) and Israel’s Noga Korem (GT Factory Racing Team). Courdurier, Charre and Baraona fired across the final stage of the day to battle it out for podium contention. Courdurier proved that she was a force to be reckoned with today, dominating almost every stage, to claim the win in the season opener. With seconds separating the top women, Charre shaped her best Enduro World Series result to date and crossed in second position. Baraona rounded the women’s podium in third. It came down to the wire in the women’s race and despite Courdurier finishing stage three in seventh position, the French rider proved she was the strongest woman on course today. Despite world champion Hill in the mix of today’s race it was Martin Maes who fired from the start of the loose and loamy traversing track, to take out stage one. Maes flew out in front after the first stage with Portugal’s Jose Borges (Miranda Racing Team) hot on the pace in second. Less than three seconds separated the top five men with still four stages to go. 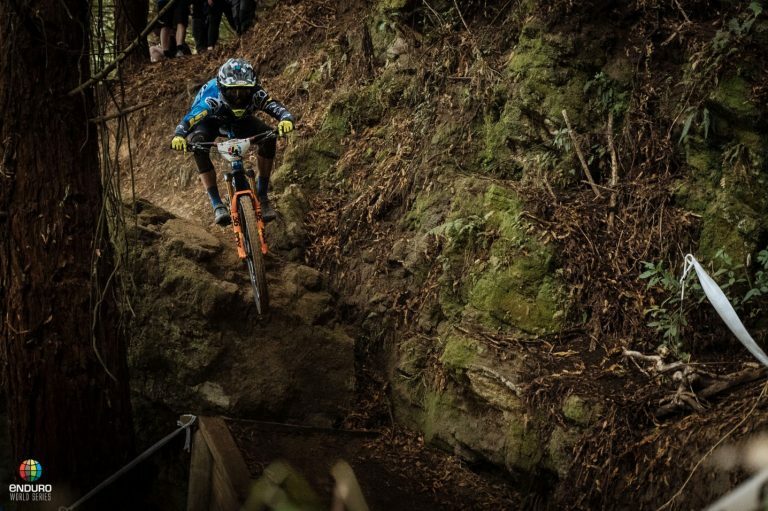 Excitement levels started to build in Rotorua as local talent Keegan Wright (Unior Devinci Factory Racing) powered to lead the stage. 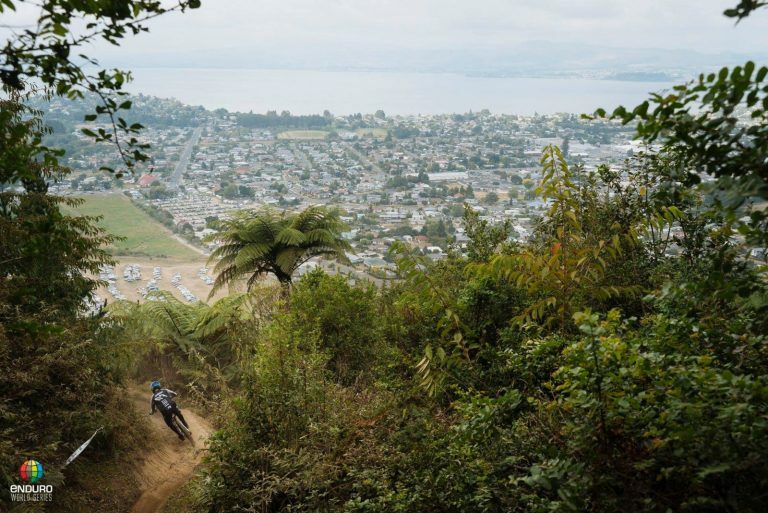 Spain’s Iago Garay, racing for Santa Cruz, New Zealand’s Wyn Masters (GT Factory Racing Team) and Sweden’s Robin Wallner, for Ibis Cycles Enduro Race Team) produced solid splits across this stage. 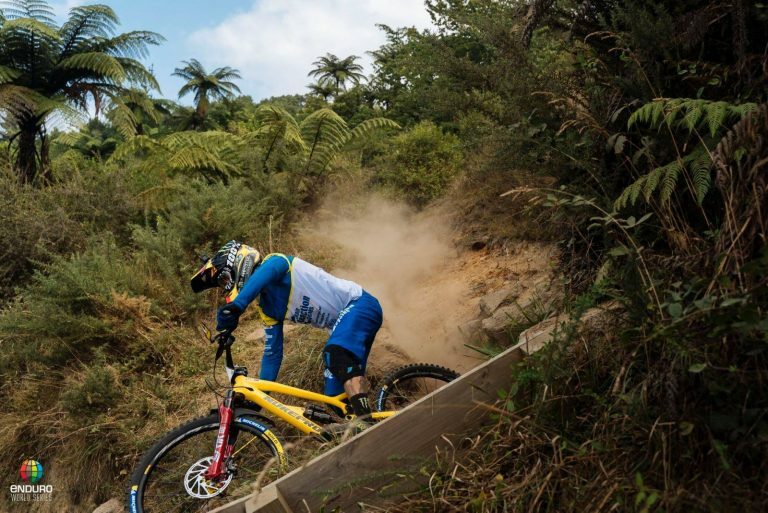 World champion Hill finished stage two in 29th position, which dropped him back into eighth place overall. With two stages left for the day, the men’s overall results included Maes, Wright and Nicolai. The final stage of the day featured the Skyline downhill track, starting out wide and flat before plunging into the forest again. 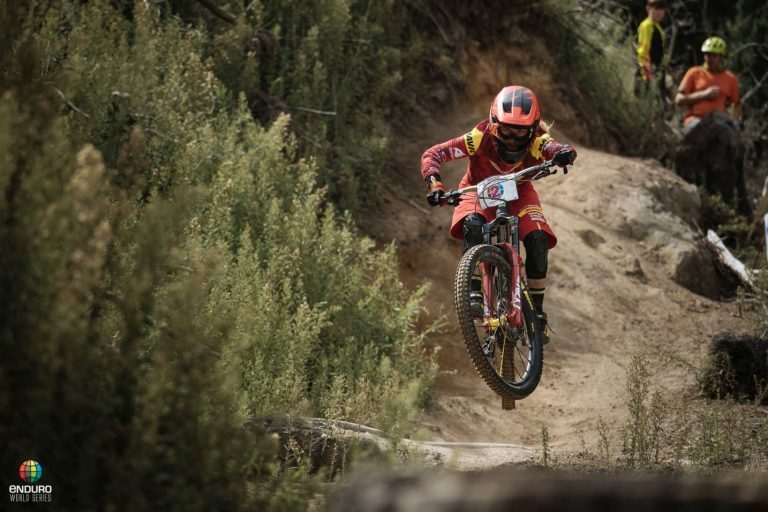 Maes, a specialist across a downhill course, slammed down a solid run to take out the final stage and claim victory in the battle of Rotorua. 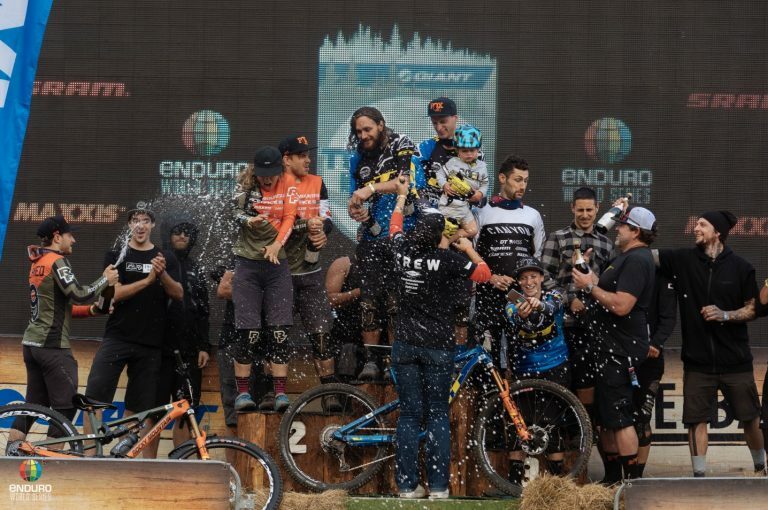 Wright produced an impressive race to be awarded with second place and Nicolai earned the final podium spot on the elite men’s podium in third.